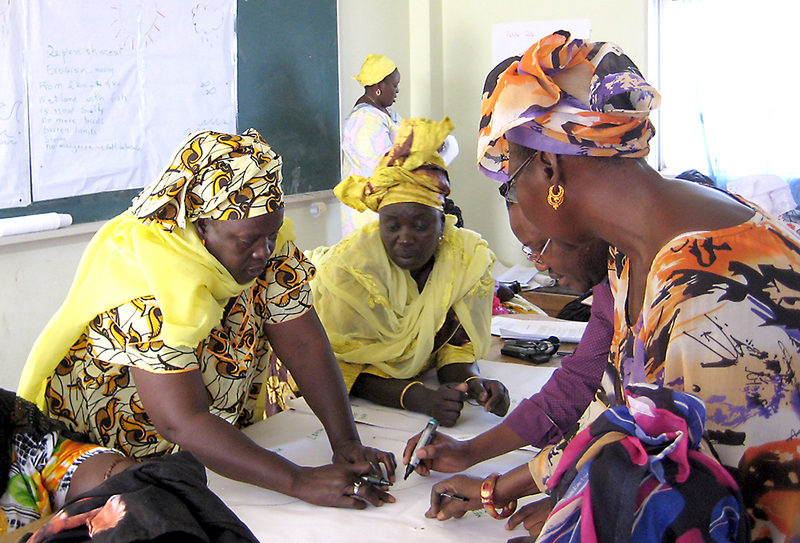 Senegalese women map their ideas, and their shorelines. Form co-management committees for selected stocks, review existing knowledge and formulate management objectives. Develop an effective system for gathering local and scientific knowledge to be included in co-management plans. Most of the stocks in Senegal are believed to be data poor, and the foundation for sound management plans includes an effective data collection system and stock assessment. This will establish clear reference points. Identify critical gaps in knowledge and design strategies to work collaboratively to obtain the needed information. Conduct participatory mapping exercises for selected fish stocks including habitat, spawning sites, migration patterns, fishing intensity by season, etc. Define harvest rules, institutional arrangements for co-management and resources needed to carry out implementation. Explore opportunities for eco-certification of fish stocks. Develop exit strategies, as necessary, depending on results of stock status reviews and include incentives and other programs for transitioning fishermen to diversified livelihoods. Five participatory, ecosystem-based management plans for Sardinella were prepared, validated by CLPA fisheries actors and approved by the Minister of Fisheries and Maritime Economy. A draft Ethmalosa management plan was also prepared. These contributed to the implementation of the National Small Pelagic Management Plan.